Thousands of refugees in Tanzania are being given the chance to learn about computers and the internet thanks to a project fuelled by a rather unusual power source. 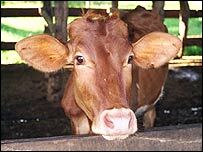 The Kasulu Internet Project in Mtabila refugee camp uses cow manure to provide electricity for its handful of machines. The project offers some of the most deprived people in Africa training in computer skills, as well as access to the internet and e-mail. The aim is to teach computer skills to refugees who have known little else but civil war and genocide, ahead of their return home to Burundi. The Mtabila project is funded by the Global Catalyst Fund, an organisation that promotes development through advances in technology. The centre is run by technology specialist Geoff Calder. "We want to give the refugees here skills in computer science," he said. "We are giving them training in business applications so that when they eventually return to Burundi, they will have the skills that that country will need to rebuild when peace comes back," Mr Calder told the BBC programme Go Digital. One of the big attractions for the refugees is e-mail, which allows them to renew family ties. "This is something we are quite surprised about. We underestimated the number of refugees that need e-mail," he said. "They have friends and family who have been displaced throughout Africa and a lot of them have gone to Europe and North America so they are finding it very useful to be able to contact their family. "They send photographs and they receive information from overseas as well." One of the students doing the computer course is Benigne Rurahinda, a 30-year-old woman who fled the brutal war in Burundi more than six years ago. "I don't really know how to express how good it is," she said. "We are learning the software that will help us in the future in our lives in Burundi and that will help us improve the lives of our fellow refugees here in the camp. "If, after my training, I am still here in the camp, I will train my fellow refugees. And then, once I return to Burundi, I will hopefully be able to resettle, and find a job more easily," she said. After training sessions in the morning, refugees from all over the camp come and surf the web. With only 10 computers in the centre and over 50,000 people living in the camp, there is often a long queue. But the refugees seem to think it is worth the wait. "All you have to do is buy a ticket and then get on with writing your messages," said one refugee. "It has really changed our lives because it is much easier and cheaper than using the postal service." As is the case with other projects in refugee camps all over Tanzania, organisations are expected to help the local community as well as the refugees. 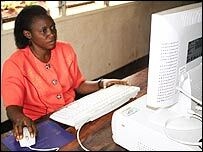 In this case, the Kasulu Internet Project has set up an internet café and a computer school in a teacher training college nearby. 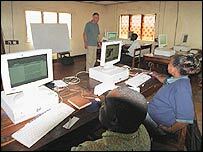 "The centre was put here for computer training for the trainee teachers but in the evenings, we open up for the local people from Kasulu town to come and use it for internet and for e-mail," said Mr Calder. This is a good way of generating income that supports the rest of the project. It certainly maintains our internet connection and gives us some funding to look at the long-term sustainability of the centre." None of this would be possible without the 12 cows lazing in the field at the back of the teacher training college. Manure from the cows is collected and fed into a 50-cubic-metre gas digester. The waste is fermented and the methane produced is collected. "We feed the manure into the generator that we're running at 70% gas and 30% diesel and that runs the computer school for about eight hours each day," said Mr Calder. Nothing goes to waste. The slurry that comes out after the methane is produced is used to fertilise the garden where vegetables are grown for the college. Despite it still being in its early stages, the project is already having an impact. For the refugees, war in Burundi may still prevent them from going home, but they are wasting no time in preparing for the day they can. This method of using manure to generate power could soon be replicated in teacher training colleges throughout Tanzania.